I really am such a fan of Melissa West. I truly have not read anything from her that I haven't liked. So, of course, this book was no exception. I love how she paints her characters. I love how each and every one of them has such a great personality, how they grow and change and become better for their experiences. It's such a satisfying experience to read one of her stories! Grace, a totally relatable character. Ok, so I'm not wealthy like she is but I can totally understand her need and want to be independent of her family. To make a name for herself without having to link to her father, a billionaire who only seems to want to control her and her choices in life. It's nice to see that her family's money does not bind her. She's willing to branch out on her own, no matter how "poor" it makes her, and seek the career path that will make her happy. This is a great role model for women everywhere. It's a testament to women that you really can do what you want to do and be independent! Grace is spunky and has much more self-confidence than I think she even realizes! Noah, well, his loyalty to his family is what got me. Right from the start I could feel his bond to his brother and the fact that there was nothing that could come in the way of that. That he would do absolutely anything in his power to make sure Jonah lived a good life and was taken care of. I did feel badly that Noah carried such a burden on his shoulders. That he felt like he couldn't let others help him out. But it was certainly a testament to the amazing man he is. Certainly these two are mismatched: the bartender and the rich socialite. But their relationship really does work. Of course it starts off with a bang, the chemistry between the two palpable from the first page they meet. But, as with so many love stories, neither of them really feel they deserve the other. They flit about, ignoring the elephant in the middle of the room that is their budding relationship, and make like neither wants to have anything to do with the other. Of course this never works for anyone, does it? As with all her other books, West has great pacing. I wasn't bored and waiting for things to happen. Well, maybe I was waiting for the main characters to come to their senses but I expected that. I loved how she introduced the supporting characters, as well. The book had emotional depth that I wasn't actually expecting. I thought it would be so much more flighty with the story line. But it really wasn't, which was such a great surprise! 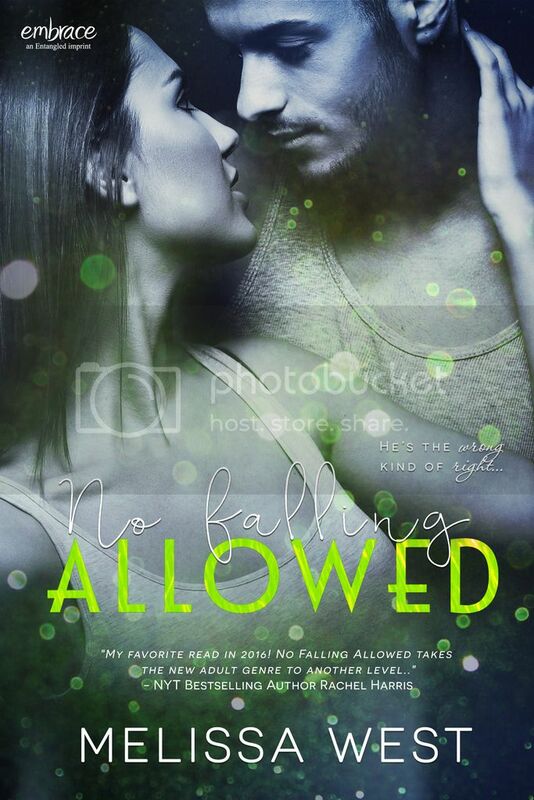 If you're looking for a love story that has strongly motivated main characters who know exactly what they want, then you'll enjoy this second installment in West's No Kissing Allowed series. And no need to read the first book in the series, this can definitely stand on its own. Melissa West writes heartfelt Southern romance and YA sci-fi romance,all with lots of kissing. Because who doesn’t like kissing?. She lives outside of Atlanta, GA with her husband and two daughters and spends most of her time writing, reading, or fueling her coffee addiction.